•	1/2 a kilo of cut chicken breast meat to long fingers. •	1/2 a cup of tahini. •	A mashed garlic clove. •	1 or 2 tablespoons of sour lemon juice. •	2 tablespoons of minced parsley. •	Oil to fry chicken. •	1 a little shaken egg. •	Cut the chicken meat to a shape like tall fingers. •	Dunk the chicken fingers in flour and then in the egg and then in the grinded cake. •	Put the chicken fingers in the fridge for an hour to 2 until they freeze. •	Heat the oil and fry the chicken fingers until it becomes golden and mushy. 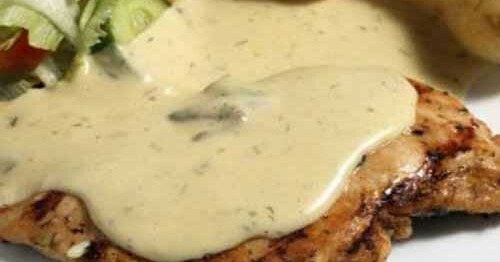 •	Taratour sauce: •	Prepare the taratour sauce by mixing tahini with garlic and sour lemon juice and salt and asuitable amount of water to get awishy washy sauce. •	Pour the taratour sauce on chicken and decorate the plate with minced parsley.